West Brom manager Steve Clarke insists striker Peter Odemwingie remains a "valuable member" of his squad. Odemwingie, 31, tried unsuccessfully to force a move to QPR on 31 January. 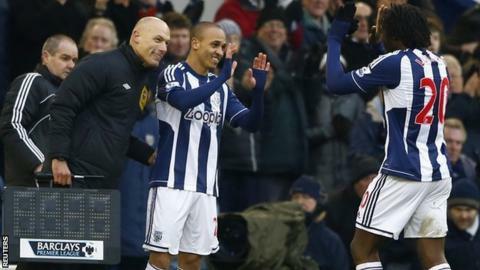 The Nigeria international was booed by Baggies fans when he came on as a late substitute in the 2-1 over Sunderland. Peter Odemwingie has scored five Premier League goals in 19 appearances for West Brom this season. Only Romelu Lukaku (12) and Shane Long (six) have scored more in 2012-13. "He was always going to come back into the squad. I can't have any comment on what the crowd think, but he is a valuable member of my squad and a talented member," said Clarke. "It's good to have him back in it." Odemwingie, who has scored 31 goals in 84 games for Albion, turned up at QPR's Loftus Road ground on transfer deadline day despite the clubs failing to agree a deal. He was then fined two weeks' wages by West Brom and was not included in his side's games against Tottenham and Liverpool. But he returned to action when he came on in the 87th minute against the Black Cats, replacing Romelu Lukaku, whose two goals gave Albion the victory and moved them up to seventh in the Premier League. Despite the reaction from The Hawthorns crowd, Clarke thinks it is time for the supporters to move on from the incident. Asked if he was surprised by the booing, Clarke replied: "No, but I hadn't noticed it as at the time I was worrying about us throwing away a two-goal lead. "For me the incident is finished. I don't like talking about it and everyone should move on."